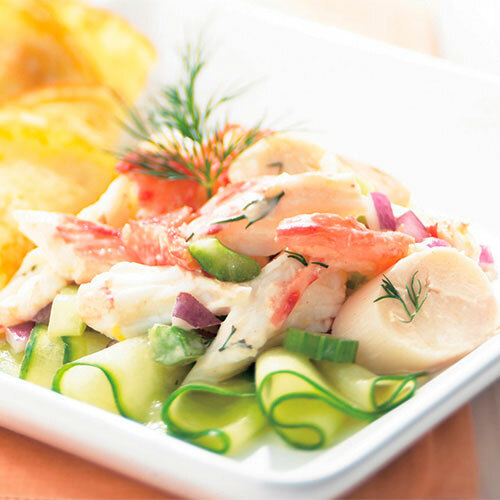 For salad, remove crabmeat from shells and place in Classic Batter Bowl (see Chef’s Corner). Add hearts of palm, celery and onion. For dressing, zest lemon using Microplane® Adjustable Grater to measure 2 tsp (10 mL) zest. Juice lemon to measure 1 tbsp (15 mL) juice. In Small Batter Bowl, whisk mayonnaise, half of the zest (set aside remaining zest for crêpes), juice, hot pepper sauce, garlic and dill weed until well blended. Add dressing to crabmeat mixture; mix gently. Cover and refrigerate until ready to serve. For crêpes, whisk together milk, egg, flour, butter, sugar, salt and reserved lemon zest inStainless (2-qt./2 L) Mixing Bowl until smooth. Heat (8-in./20 cm) Sauté Pan over medium heat until a drop of water sizzles, then evaporates; grease lightly. Pour scant 1/4 cup (50 mL) batter into pan, immediately tilting and swirling pan to cover bottom. When crêpe starts to bubble and edges are brown, turn using Small Nylon Turner. Cook about 1 additional minute or until lightly browned. Remove from pan. Repeat with remaining batter. To serve, spoon salad over cucumber ribbons; garnish with fresh dill sprigs, if desired. Serve with crêpes. Recipe courtesy of Pampered Chef.